I’m not gonna bury the lede here: in this static test with a difficult adapter lens, the Z7 is far more accurate at autofocusing than the D850. Now that I have the FTZ adapter, testing of the Z7’s autofocus accuracy has moved to the top of my priority list. 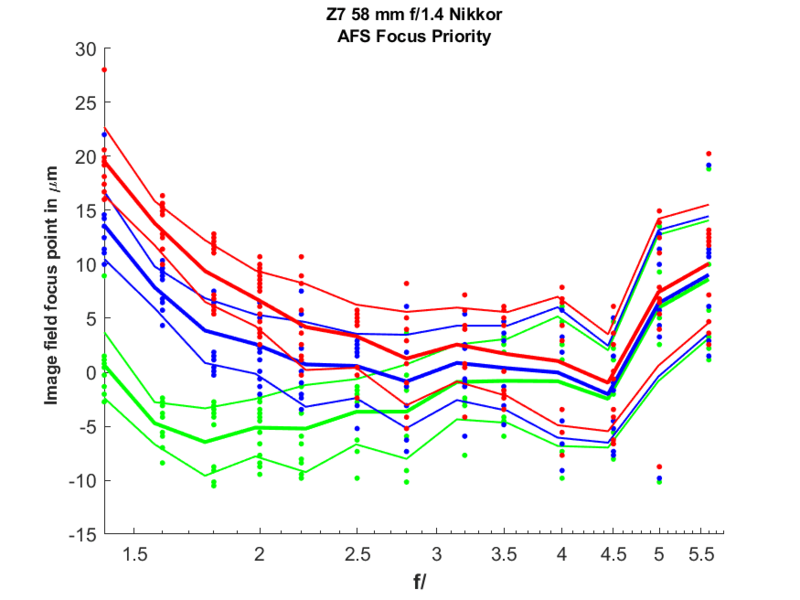 I chose a test lens that I consider to be a severs challenge to autofocus systems: the Nikon 58 mm f/1.4. This special-purpose lens has a lot of character, which in my book translates to “adorable flaws”. In the case of the 58, those flaws include longitudinal chromatic aberration (LoCA) and spherical aberration (SA). The LoCA challenges the camera to find the focus position that optimizes the sharpness of the luminance signal, which means that the sharpness of some colors will be sacrificed. Some cameras do this well. Some camera and lens combinations (like the Sony a7RII and the Batis 85) cause the wrong color plane to be sharp. SA means that the location of the in-focus plane shifts as the lens is stopped down, which can trip up PDAF systems that use a narrow range of effective apertures for focusing. Here are the results of my testing, using AF-S, with the release priority set to “focus” and smallest user-defined spot focal point. There are 10 measurements per tested aperture. They are plotted as dots. I measure the focus location in each of the Adobe RGB color planes, and which plane the measurement came from is indicated by the color of the dots. I’ve plotted the mean, mean-plus-standard-deviation, and mean-minus-standard-deviation values as lines. The amount of scattering in the dots and the distance between the mean-plus-standard-deviation and mean-minus-standard-deviation gives you an idea of the experimental error. 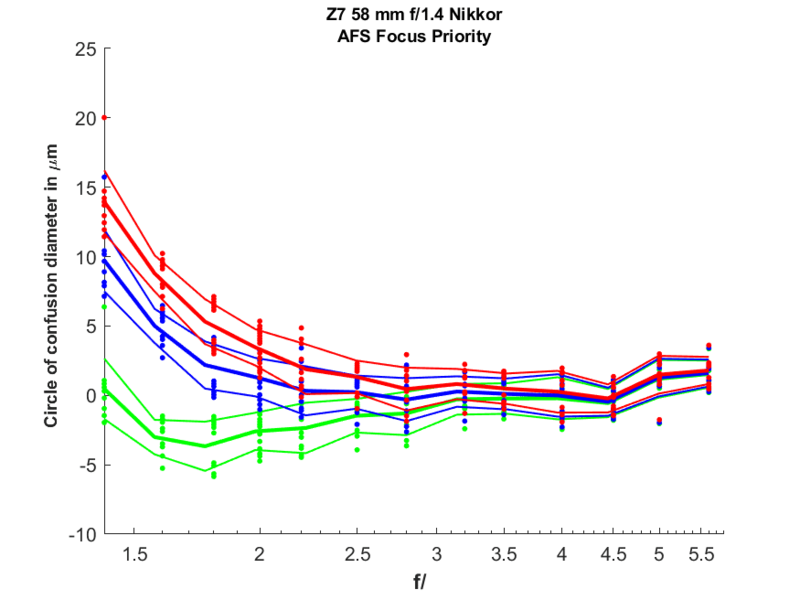 The vertical axis is focus error at the image sensor in micrometers, with positive numbers indicating back-focus. You can see the effect of the LoCA: there’s a 20 um spread among the locations where the three color planes are brought into focus. You can also see that the camera picked the right plane to focus on — most of the luminance signal is green light. The pitch of the Z7 sensor is a bit over 4 micrometers (um). So the plus and minus one standard deviation CoC errors for the green plane at the sensor is within one sensor pitch of perfection. This is a spectacular performance from the Z7. I thought it would be good, but I had no idea it would be this good. 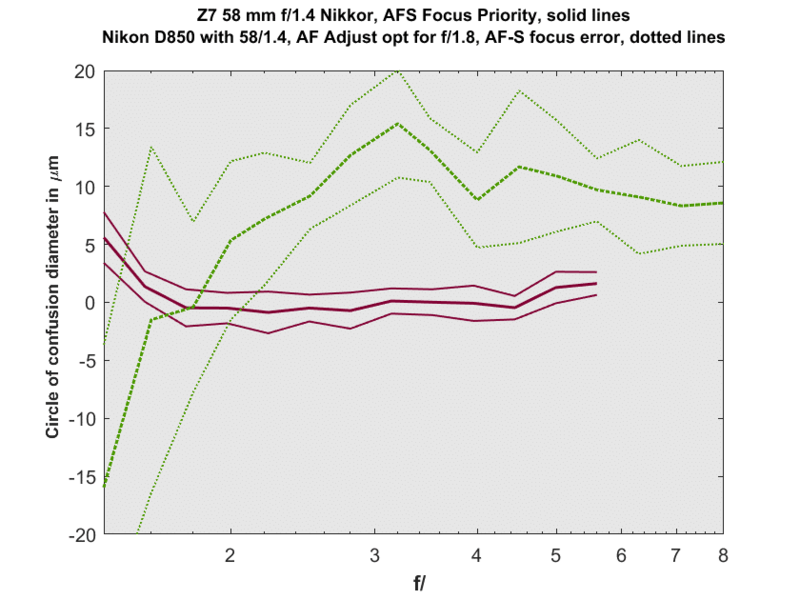 Let’s compare the Z7 results with those obtained with the same lens mounted on a Nikon D850 and optimized with AF tuning for f/1.8. 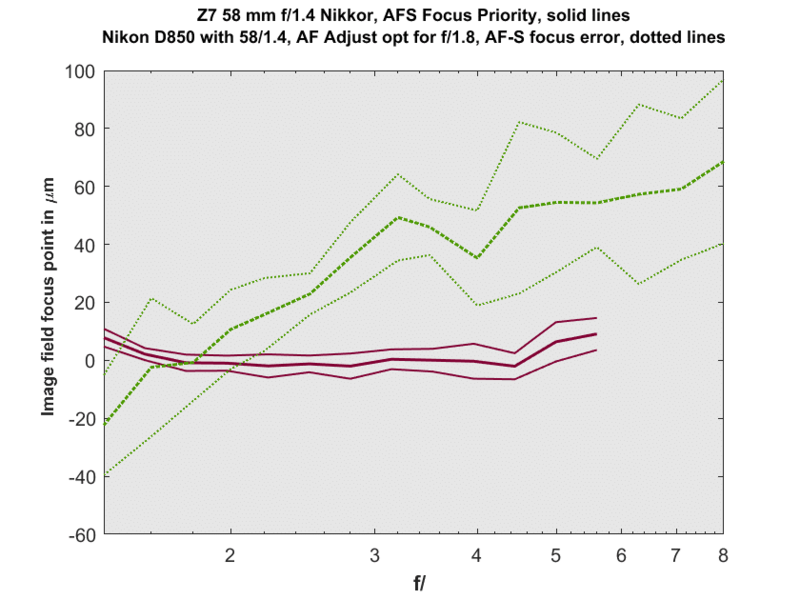 The green dotted lines are for the D850, and the red solid ones for the Z7. Luminance sharpness is the criterion for the plane location calculation. 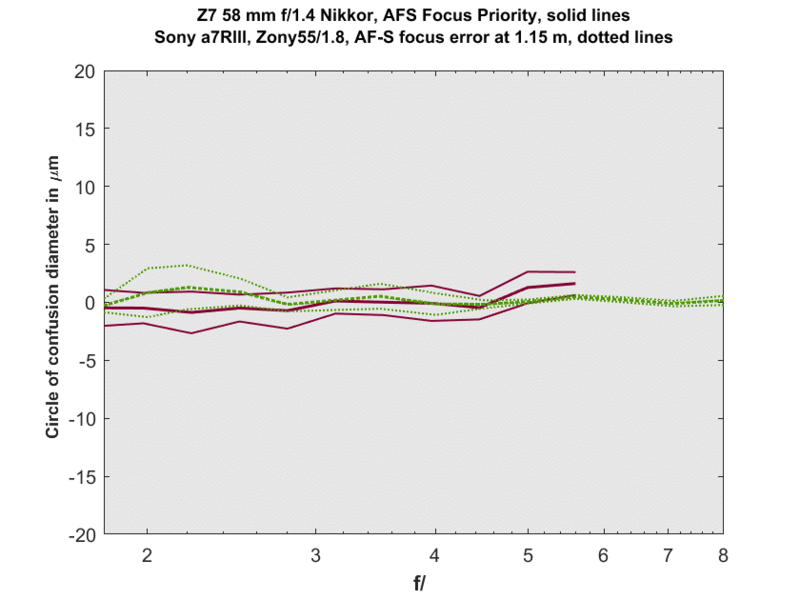 Not only are the mean errors much smaller for the Z7 than for the D850, the scatter, as indicated by the distance between the thinner plus and minus one standard deviation lines is less with the Z7. Note that the red channel pulls the luminance error upwards at f/1.4, as the camera is optimizing for the green channel. Here’s another comparison, with the a7RIII and the Zony 55, which is a much more well-behaved lens with respect to SA. Both cameras are doing a great job here. Unlike the D850, which doesn’t move the focal plane if the PDAF reading says the image is already in focus, the Z7 adjusts focus for the second and subsequent exposures; you can see the ring on the lens turn back and forth as the focus is sought. This means the AF is slower than the D850, but it also means that the chances for the sharpest possible shot are increased. The D850, on the other hand, can lock itself into a close-but-no-cigar focus plane, and sit there fat, dumb, and happy. Of course, you can lock focus on the Z7 if you wish. The original sentence in the IR interview with the Nikon Z7 engineers has been changed. Now they say that both phase and contrast-detect AF are used with F lenses. I use Imatest to get values for edge softness (MTF50 LW/PH) and today I was working on my Z7 with “F” mount lenses. I was troubled because I couldn’t get the camera to respond as all my other Nikons. As you change the AF Fine Tune, you will see a bell curve of the sharpness from soft to sharp to soft. But my results were flat lined. Then it hit me. I was using AF-S, single point AF and this mode apparently has the CDAF after the PDAF movement which was cancelling out my AF Fine Tune correction. Then I switched to AF-C, single point Af and Ah-HA!! My bell curve returned. Moral of the story- If you want to fine tune your lenses, it will only work if you are in AF-C because apparently there is no CDAF trim in AF-C!!! P.S. I can get much better edge sharpness using AF Fine Tune and PDAF, than I can relying on CDAF. I’m just not a fan of CDAF. It would be interesting to see how the Z6 behaves in this regard. Where have you seen that the Z6 does not have the CDAF phase in AFS? I just was linked from Nikonrumours to this article. I never saw your website and wanted to thank you for your well thoughtout tests and explanations! Really great blog and outstanding stuff! Thanks again and keep up your great work! You can look at the jpeg sequence or download the video and scrub the timeline. I also would love to see real world pictures @1.4 !